To Dos are actionable notes that can be used to communicate priorities and assignments. 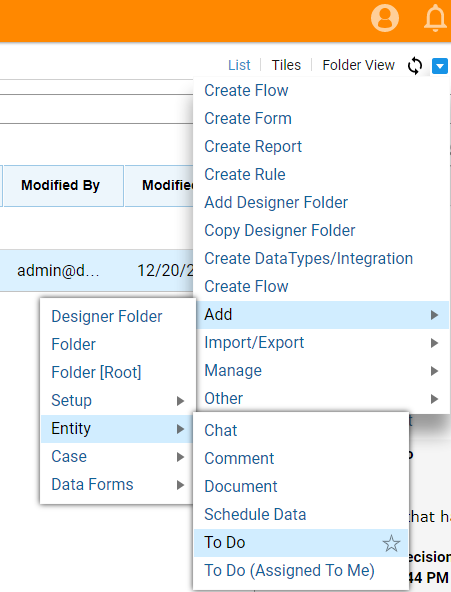 These notes can be assigned automatically by flows or on-command by users. Users who receive To Dos will find them listed in the Tasks	panel of their, My Home,	page in the portal. In this example, we will assign a To Do task to ourselves. Afterwards, we will assign a To Do task to another user. Our first To Do will be assigned to ourselves. On the top right locate the Actions	drop down. Select Actions > Add > Entity > To Do (Assigned To Me). In theTo Do popup, enter the details of our assignment. 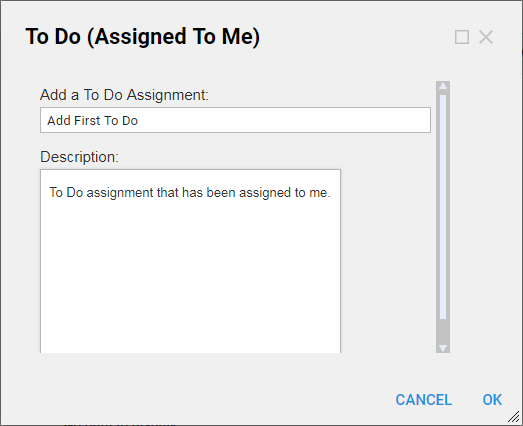 In the Add a To Do Assignment	field, type Add first TO DO	. In the Description	field, type To Do assignment that has been assigned to me	. Click OK	.
As the To Do appears in our Tasks	panel, a popup notification also appears in the upper-right corner to let us know that we have a new task. Next, assign a To Do to another user account. 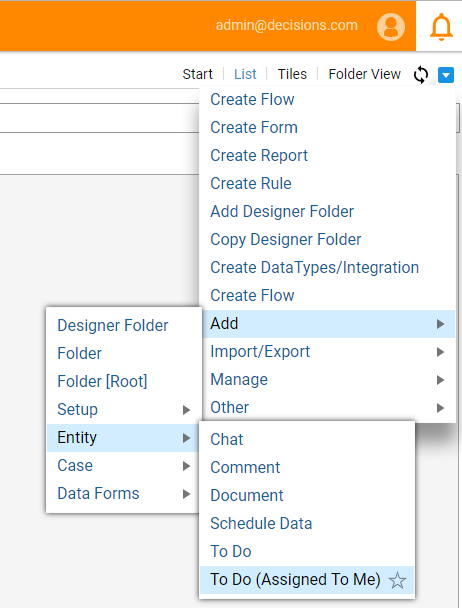 Click Actions > Add > Entity >	and select To Do	in the resulting menu. In the Add To Do	popup, we will enter the details of our assignment. In the Title Field	, we will type Adding TO DO for a User	. In the Description	field, we will type TO DO for a User	. 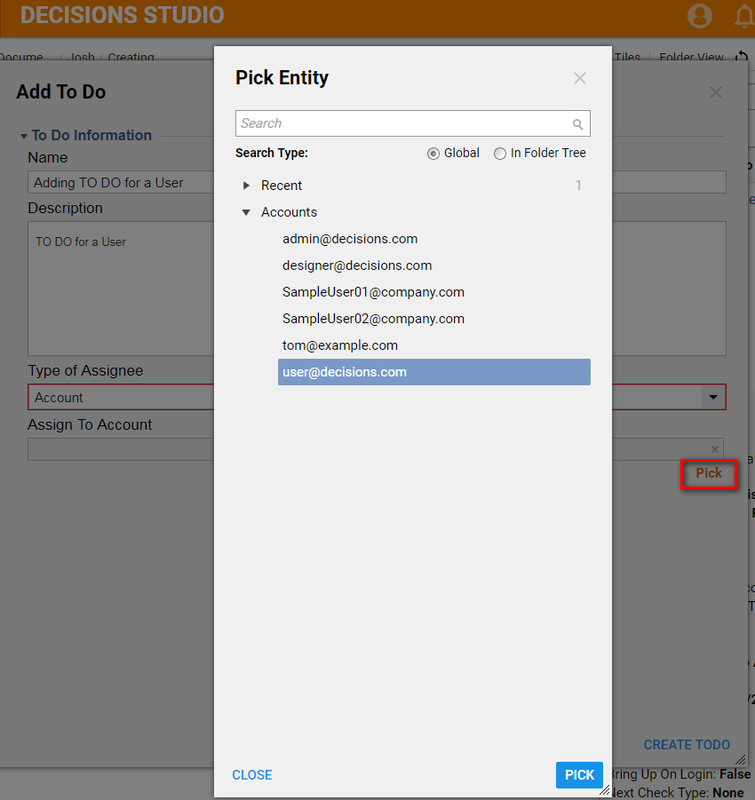 To assign this To Do to another user account, we will first select Account	in the Type of Assignee	drop down list. Next, we will click the Assign To Account	selector and, in the resulting popup, select a different account. This completes our To Do Assignment	. Click Save	. 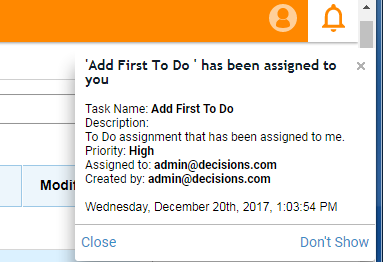 As the To Do appears in another user&apos;s Tasks	panel (but not in ours), the admin and user will see a popup notification that lets us know a new task has been assigned.